Choosing the best paint color for your room is fun, but it can also be confusing when trying to coordinate with furniture, window coverings, and other rooms in the house. 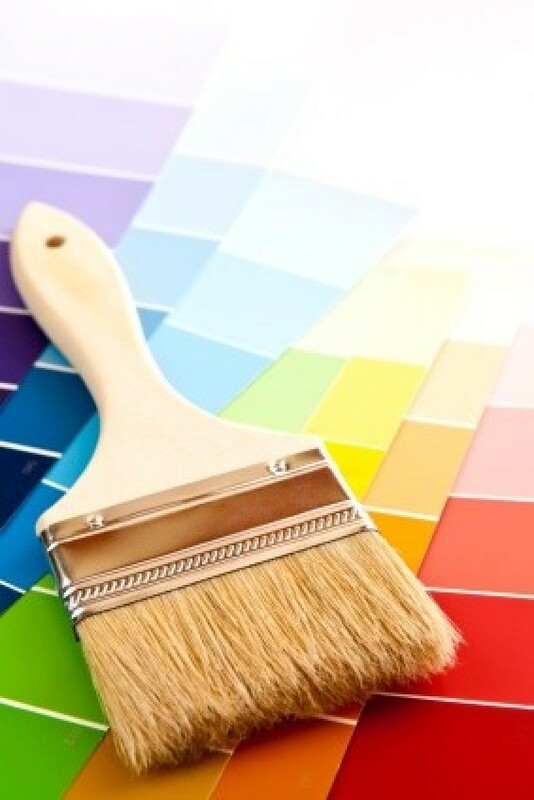 This is a guide about choosing paint colors. Choosing the perfect color for that room can be a tough decision but I am here give you some tips on how to pick the color that will be perfect for you and your personality. I am going to assume that you know what furnishings are going into the room. The easiest way to pick a color for any room is to draw from what you already have. Choose a color that is a shade or two lighter than a say a color in your couch or go darker for a more dramatic look. Now if you are re-doing a complete room and buying everything new, I would find one element of the room that you really love and go with that color for your wall color. When you find that color you love, try to have that color (just a little) in each of your accessories to tie the room together. Most people make the mistake of painting their ceilings white. One sixth of your room is ceiling. If you paint your ceiling a lighter shade of your wall color, it will make your room feel higher and if you paint your ceiling a shade darker, it will make it feel cozier and lower. Also you should consider the light in your room. If it is a dark room that only gets light for certain times of the day then you would want to stay away from dark colors and use your paint to lighten up the room. If you have strong light from lamps or overhead lighting, you may want to go with a medium shade of that color that you love. Always try to get a small paint sample of your color if you can because that way you can paint a small patch on the wall and see how it looks at different times of the day. Paint color is a very personal choice so try and find a color that fits what you love and your lifestyle. First, you need to understand a little something about color. Color is broken down into three categories: Warm, Cool and Neutrals. There are many shades of color so here is something to remember. Light colors are expansive and airy, they make rooms seem larger and brighter. Dark colors are sophisticated and warm; they give large rooms a more intimate appearance. Let's start with the warm colors. Warm colors are red, orange, yellow. Red is the color that is an attention getter. It is the most dramatic color of the warm color group. We associate red with love, valentines, danger, desire, speed and strength. The most emotionally intense color, red stimulates a faster heartbeat and breathing. Red raises a room's energy level. In the living room or dining room, red draws people together and stimulates conversation. In an entryway, it creates a strong first impression. True red is considered to be too stimulating for a bedroom but a color like burgundy which will be mostly seen by lamp light can be very elegant and restful. Red is also a very good color to use as an accent. Crimson red can make some people feel irritable. So this is a color that can be used as an accent. Pink, the romantic shade of red, can be used in bedrooms and is considered restful. From a medium pink to the palest shade, it can help you set a restful and cheerful mood for any room. If you paint a room extensively in red, the furnishings and accessories should be neutrally or lightly colored, so that the eye is not distracted by a whole lot of contrasting colors. Red is a perfect color for an accent wall to add "punch" to a room. Yellow captures the joy of sunshine and communicates happiness. Yellow represents optimism, idealism, imagination, hope, summer, gold. Cheerful sunny yellow is an attention getter. Although yellow is a cheery color, it is not a good choice to be used as the main color scheme of a room. Researchers have found that people are more likely to lose their tempers in a yellow room. Babies also seem to cry more in a yellow room. It's perfect for kitchens, dining rooms, and bathrooms, where yellow's happy color is energizing and uplifting. In halls, entries, and small spaces, yellow can feel expansive and welcoming. Yellow also makes a wonderful accent color where every a "little ray of sunshine" is needed. One thing to keep in mind is that yellows and golds can be overdone. It can be hard on the eyes so use it sparingly. Soft buttery yellow can brighten a dark room and make it more welcoming. Orange is a combination of yellow and red. Orange is considered a warm color like red. Orange expresses energy. It symbolizes balance, warmth, enthusiasm, vibrant, flamboyancy, and is demanding of attention. Orange works well in family rooms and is also a good choice for children's bedrooms. This color is great for an exercise room. It will help bring all the energy out that you need when jumping into your fitness routine. Orange's darker, richer tones carry much of the personality of reds, bringing vibrancy and warmth. Like reds, these darker tones are best used in conjunction with more neutral colors because they will grab the eye. Now let's look at Neutrals. All neutral schemes have their own challenges. Their virtue lies in their flexibility: you can add color to liven things up or subtract it to calm things down. Black is the absence of light and therefore, of color. It represents power, sexuality, sophistication, formality, elegance, wealth, mystery. It is also stylish and timeless. Black is best used in small doses as an accent. Indeed, some experts maintain that every room needs a touch of black to ground the color scheme and give it depth. Generally, black is a great furniture color. White is what we see when all colors come together in perfect balance. It represents reverence, purity, simplicity, cleanliness, peace and winter. All white rooms can come across as sterile and cold. Purely white rooms rarely feel open and sunny. White can have a depressive affect on mood. All white rooms can be warmed up using different shades of white such as cream and off white. White should always be used in concert with other colors, whether it is painting a single accent wall to give the room punch, or adding color through furniture, some colorful artwork and accessories. White, when used with black, creates a very sophisticated, formal look. White can also be used with darker reds, blues, greens, and purples to lighten the otherwise overpowering effect of these colors. Solid, reliable brown is the color of earth. Brown represents safety, earth, masculinity and home. Chocolaty, mocha browns can create a very warm and inviting atmosphere. Though it is a dark color, it should create feelings of warmth, like chocolate and a good book on a cold night. Brown works very well with other browns, so several different shades can be used in your choice of furniture and accessories. Cool colors are considered the "Calm" colors. Blue represents peace, tranquility, calm, stability, harmony, unity, trust, truth, confidence, sky, water, cold, technology, and depression. Blue can "slow the pulse rate, lower body temperature, and reduce appetite. The color of the sky and the ocean, blue is one of the most popular colors. It causes the opposite reaction as red. Peaceful, tranquil blue causes the body to produce calming chemicals and is used in any room where a sense of peace is wanted. Blue is the perfect color for a bedroom where you would like to release the tensions of the day. Beware of pastel blues as they can look beautiful but make a room feel chilly. To offset this, you can use accessories in the warm blue range. In large rooms like your playroom or family room, you may want to stay with the warm blues like bright blue. Green represents nature, environment, health, good luck, renewal, youth, vigor, spring, generosity, fertility. Green is suited to almost any room in the house. 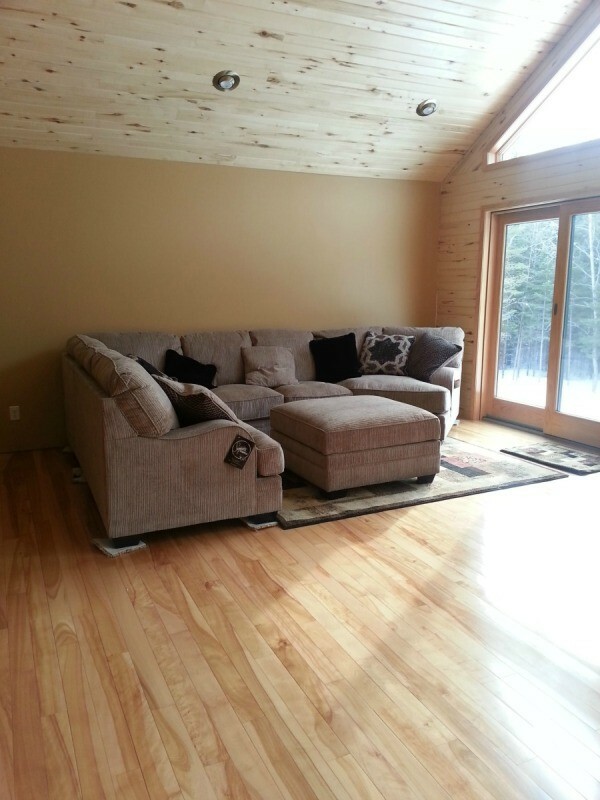 In a family room or living room, it encourages unwinding but is warm to promote comfort and togetherness. Green is considered the most restful color for the eye In a bedroom, it's relaxing and comforting. Green also has a calming effect when used as a main color for decorating. It is believed to relieve stress by helping people relax. Also believed to help with fertility, this is a great choice for the bedroom. In a kitchen, any color of green cools things down. Light greens work well in baths and living rooms; mid-range greens are a great accent for kitchens and dining rooms. Purple represents royalty, spirituality, nobility, ceremony, mystery, transformation, wisdom, enlightenment. Purple is considered an exotic color. Purple at its darkest can be sophisticated and be luxurious. Colors like lilac and lavender can be restful and is a great choice for a bedroom. I hope this has given you some ideas on how to pick a paint color that will represent you and your lifestyle. Does anyone have any suggestions on what color to paint our bedroom? We have a red satin duvet cover and our room will be asian inspired. I bought a red and black oriental rug and had a handyman help me choose a wall color to go with the rug. He picked out several shades of red paint chips which we used to find the matching red in the rug. We then returned to the store to find a complementary color to that shade of red. I opted to move up a few shades and ended up with a warm salmon pink. At first I thought it was too much, but I really like it now. How about a warm gold? I like the idea of a pale jade green. Or how about ivory, or pale bamboo-brown/beige? I think paint that matches the duvet would be a bit much. Besides, if everything is the same color, the duvet will just melt into the background and won't stand out. If it is a deep red I would go with a black accent wall that the bed would be on. Also some golds and deep reds are good colors for that. I recently bought a new house and the dining room is the color of pea green, which I like, but I want it to be asian theme. My questions are what works best with that color? For curtains and rugs. I am going to be getting a black dining room table to go in that room and I have some asian art work to put on the wall. But every time I look for something asian theme on the computer it always shows a red wall, I really dont want to have to pain the room over. Any suggestions would be greatly appreciated. I need some advice regarding my kitchen ceiling which has become stained due to cigarette smoke and cooking. 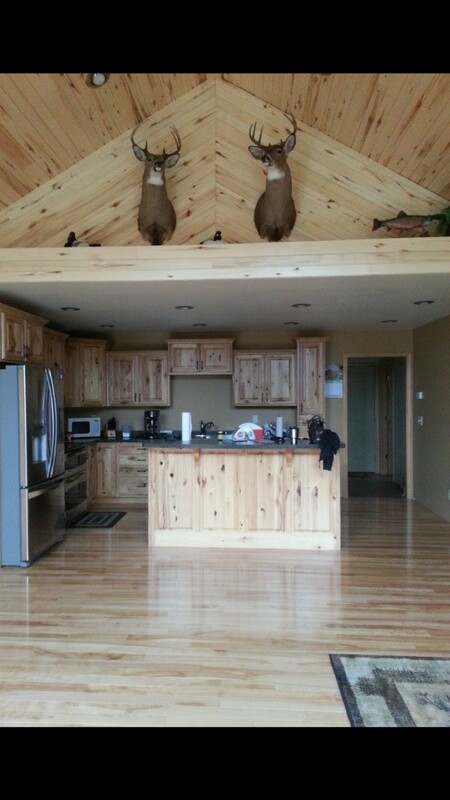 My kitchen isn't very large and has light oak cabinets and cream colored walls. It leads off into the sitting area where there is a large french window. I have no window in my kitchen, but it's not too dark. I'm wondering what color to paint the ceiling as I know that white will discolor very rapidly. My color theme for accessories in the kitchen is red and the living area is cream and beige with touches of red. The ceiling in the living area is white and the walls are cream. Any suggestions, please? I'm really stumped as to what color to choose. I would still paint it white, it will brighten up things and if you paint it an off white or taupe it will also darken and look even darker. Good luck. What about a color like terracotta? But a lighter color of it, like a light baked clay? You could mix white paint in it till you got the color you liked, maybe more in the reddish family to go with your red touches. I'd love to see how it turns out whatever you decide; can you post a picture if you decide to paint your ceiling? Hi Cett, I agree with Metroplex's idea! If you choose that idea the height of your ceiling should determine the depth/darkness of the terracotta. If you have a high ceiling use a deep terracotta and if you have a low ceiling use a lighter terracotta. I'm really impressed! Light terracotta sounds lovely. I don't have high ceilings since I live in a very old cottage which once had high ceilings with wooden beams but had been replaced many years ago with steel beams which i have had to hide with a false ceiling in the kitchen. Shame really, but I'm assuming that it was a necessity to keep the roof from falling down. My home is hundreds of years old. Thank you so much. I knew I could rely on you all for excellent suggestions! When it happens, I will post a photo. Thank you all again. I need paint color advice for an open concept kitchen, dining room, and living room. My kitchen has hickory cabinets and gray counter tops with blues, gray, and light brown flakes in it. The current color is a sandstone color, but doesn't accent the beauty of the wood. It blends in with it. I have the same color in my living room and dining room. 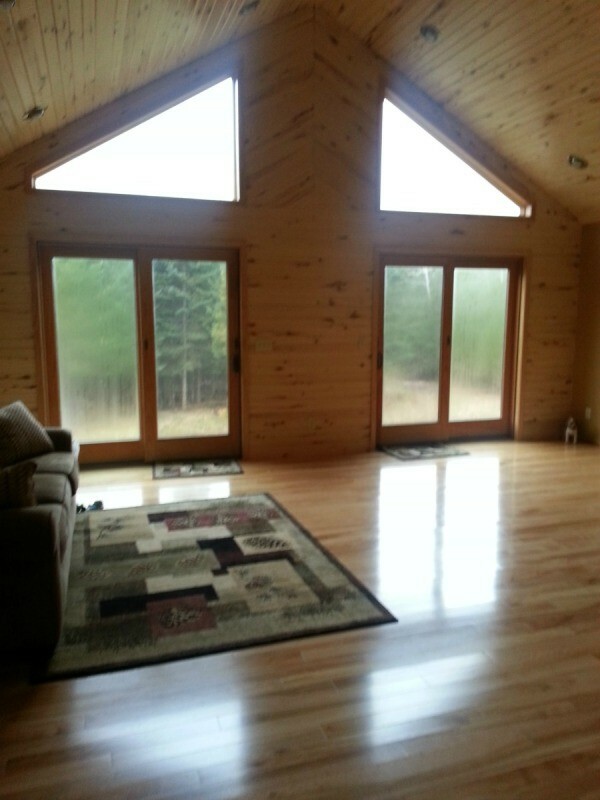 My house has 1 wall that is cedar tongue and groove along with my ceiling. My floors are also hickory. What color would you suggest to accent the wood, furniture, and cabinets. Consider using a blue that is a few shades darker then the blue in your countertops. With so much neutral color in floors and wall and cabinets, some contrast might be good. Hope this is helpful. Question: Please Help Me Choose a Paint Color! My master bedroom we just painted deep red (I love it). My hall wall is chocolate brown I still need to paint the two extra rooms! I need help deciding what color to paint them. Do you have any ideas? I take it all these rooms can be seen from the hall so you want colors that coordinate? How about tan and a deep green? Red, green and browns coordinate well and, I think, give a luxurious, sophisticated look. I like perfumed fan's suggestion. I have azul carmel in one bathroom and volga blue in another and I need help in selecting a paint color for the walls. I was told a warm silver but I am leaning to the warm blues. I am looking for paint colour ideas for a kitchen. The kitchen is big with light oak kitchen unit and oak doors and skirting. I would also like ideas for the hall and landing colors. The hall and landing have plenty of light with oak stairs and oak doors and skirting. One wall runs from the hall downstairs right up to the landing ceiling upstairs. I was thinking of doing this wall in a darker colours than the rest? I am about to put my house up for sale and was planning to repaint the interior. I am wondering if I should paint everything the same color or different colors for each room? If different colors, are there certain rooms which should be painted the same to blend together? Neutral colors that are light enough to be painted over easily by new owners are best. I would paint any open plan rooms you have the same color. Different neutrals in rooms that do not open into one another could be done. If you plan to paint the whole house, go with one color all over because it is easier, and probably cheaper as you won't have several partial buckets of paint left. Hope this is helpful. The primary wall color in my home (living, dining, family, kitchen, hall) are all a light yellow (French Sonet). The yellow is very light with a small hint of brown. I have a laundry room, guest bathroom and two bedrooms I would like to repaint, but I am not sure what colors I could use that would compliment these other rooms. I thought a light beige/cream for the bedrooms. Carpet is not a problem since I will eventually be replacing that as well. However, for the bath and laundry, I have tile which is kind of a rustic color that went okay with the yellow, but I don't want yellow in these two rooms. I am getting kind of yellowed out. Any suggestions? I'd like to incorporate some blue, but I am not sure if that would work. My home is old world/traditional with yellow, browns and copper colors, with sage accents. Use Nature as a guide. I think that the color of sunflowers against a blue sky are beautiful. So if it works in Nature it should work in your house. I would just be careful not to choose too dark a blue color or it would be too dominant. Brown and Beige are neutral tones so they go with anything. But most of all have fun and if you like it then who cares what others think. Try your local paint store for samples.They can help you choose several colors to take home and put on your walls,live with them a few days,check morning,afternoon and evening lighting.Then you'll have a better idea on what YOU like. And really, if after a few weeks you end up just hating your choice,repaint, life is short. Is there any software available where I can upload a picture of the interior of my house and then paint online with different colors? You may not be able to find software in which you can use your own pictures. Online you can see what their various rooms look like with different colors of paint, but the pictures they use have been edited in an image editor such as Paint Shop Pro, to make the background a solid color. If you have an image editor, you can remove the background in your image then try different colors. You could even do it in MS Paint if you wanted to remove the background pretty much pixel by pixel. Yes, there is a way to use your own photos to test out paint colors online. Behr Paint's website has an option called "Paint Your Place," where you can paint your own digital pictures of your rooms with their paint colors, and subscription is free! Click on the "Demo" video to see step-by-step explanations of how it works. I painted my bathroom copper! What other color goes with it? Think of copper as it ages, that lovely soft green should go nicely with it. And a warm, creamy white perhaps for accent pieces. This room needs a firecracker of color to make it "pop." There is not a lot of light in this room to begin with. We have a medium gray tile floor (Daytona Beach sand remedy) and dark brown leather furniture. The walls are a combination of a medium tan and aqua. Any accessory ideas with colors to brighten it up?